Could you use a little more cash to achieve your New Year's resolutions? 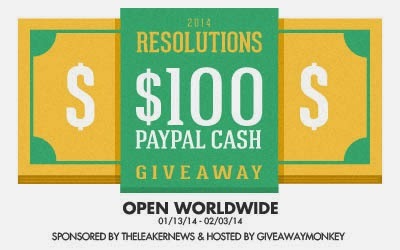 Enter below for a chance to win $100 in cash via PayPal! My resolution for this year is to walk at least three times a week in my neighborhood for exercise. I don't make "New Year's Resolutions" and never have. However I do like to take a little time to think about the past year, and about what I want to focus on this coming year. my new years resolutions are to lose a few pounds and eat healthier throughout the year. I don't make resolutions but do have hopes for the coming year. Mine is to move back home & find a good job there. Last year I resolved to lose weight, and I lost 60 pounds! I refuse to make resolutions...I only fail! I tend not to make specific 'new years resolutions' because I try to set small attainable goals for myself throughout the year! My resolution is to read 50 books this year! So far I have read one. I dont make New Year's resolutions. I just try to live my life in the right way as much as I can. My resolution this year was to eat more fruits and veggies! I don't make resolutions because I always get disappointed when I end up breaking them in a week.